This month marks the 5th anniversary of when we found out about Mini, and next month we’ll celebrate (low-key of course) the 4th anniversary of our adoption day – the day we officially became a family. So I’ve been thinking back to the early days and how they were both amazingly positive and overwhelmingly challenging at the same time…and so very different from the early days of having a newborn. Mini’s arrival was hard. As I’ve talked about before, the NC suffered post adoption depression which made an already surreal situation, even harder to cope with. 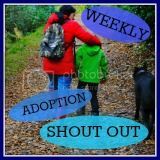 Introductions – the period where you meet your child in their foster carer’s home (and also spend some time at your home) is bizarre. Your every move is watched by the foster carer and social workers and you feel scrutinised. No matter how much experience of childcare you have, your ways will still be different. Then your child moves in, and you are still watched by social workers who regularly visit you to keep an eye on you all. You are trying to bond with this small person who has already developed bonds to other people, developed a character and personality completely different to you, you are trying to show this small person that you are a capable, kind, loving, caring and trustworthy person. And all the while, this little person is missing their foster carer and grieving for them. In addition, you’re advised not to introduce too many friends and family, because it’s important that the child learns who their primary caregiver is without the complications of other people there. So it’s quite lonely. We also had the stress of being me being made redundant whilst on adoption leave, and contrary to popular belief, maternity and adoption leaves are not equal. The rules might have changed since then, but at the time I was entitled to the same amount of time off as my pregnant colleague but when we were made redundant, she received her full maternity entitlement paid in full alongside her redundancy package. My adoption pay stopped (just 3.5months into my leave), and I just got my redundancy pay. I was very lucky, and after a restructure at the small charity I worked for, another position was found for me – a part-time home-based position. But after just a short time, I had to give this up as juggling work and a small child just didn’t work. Especially a child who was quite clingy and couldn’t occupy himself. But there’s also this wonderment and joy of becoming a parent. Looking at Mini, I felt love towards him almost straight away, although it took a while for bonds to form. He has always amazed me, and I am so proud of all he’s achieved. Dollop’s arrival was equally difficult. We were aware that it would be hard for Mini, and tried to make things as easy as possible for him, but I had a niggly pregnancy which impacted on Mini more that I’d hoped for. I was tired from the word go, had awful morning sickness, and because of my diabetes, ended up having check-ups at the hospital every fortnight for most of my pregnancy, including extra scans, heartbeat and movement monitoring, and several days on the wards to have my blood sugars monitored. I also struggled with the concept of being pregnant, as I’d believed I couldn’t conceive, and I’m sure Mini would have picked up on my slightly wobbly state of mind. I was induced 2 weeks early, again because of my diabetes, and although it was successful at starting labour off, 12 hours later I still ended up needing an emergency caesarean section, and then had to stay in hospital for another 48 hours – the longest that Mini and I had ever been away from each other. Then of course I had a recovery period of about 6 weeks, where I couldn’t lift Mini, couldn’t drive or take him out anywhere. Nanna helped out with all the nursery runs. Dollop had some complications in her first week which had me and the NC in hospital again with her. All in all it was a difficult time, but with help from all sorts of people (to whom I am very grateful) we survived. And again we had these overwhelming feelings of love, and I still look at Dollop and can’t believe I made her, and she came from me. Both situations knocked us for six. Having a baby is hard on your body physically, breast feeding can be tiring, sleep deprivation is torturous and I appreciate that maternity leave is needed for mothers to recover. But adoption is just as hard – just getting to know this new child is draining, but when you’ve never had a child before, you’re learning to be a parent. And in the early days you can’t follow your instincts, you have to continue the ways of the foster carer for a while before making routine changes. The same can be said for second time adopters (and people like me who fall pregnant after adoption) who often have a second child who is much younger than their first child was when placed, as they have to learn the skills of parenting a baby – totally different to looking after a toddler, or older child, whilst still caring for their first child and making things as seamless and as comfortable for them as possible, made even harder when they have suffered their own traumas and need extra reassurances. It’s easy to believe that adopters don’t need so much time off, but actually we need just as much time, if not more, to build a relationship with our children before launching them into ‘normal’ life – school, nursery etc. In all this talk of adoption reform, I hope that benefits and rights of adoptive parents are also considered. What are your own experiences of adoption and maternity leave? Do you think they should be equal? We have not yet adopted, that is a couple of years down the line, but I believe that adoptive leave is at least if not more important then maternity leave. You still have so much to learn, a whole new person to get to know, but you also have to throw in an extra cartload of potential challenges that don't come with giving birth, like the grieving for foster carers and attachment issues. When my brother came to live with us he had lived with 5 foster carers, his birth mother, and been in emergency placements. He then had to get used to another whole new family in us. Such a huge thing for a nearly 4 year old. He needed the time to realise we weren't going anywhere and he wasn't going to be passed on again. 23 years later and I think he knows he is well and truely stuck with me as his big sister! I really hope all the reforms do give more support and rights for people on adoptive leave as I hadn't realised it wasn't as protected as maternity leave and that is awful. Funny, I've been thinking a lot about those early days recently. I think it's because we found some videos of the kids from the early days that we hadn't seen for a while. I gave up work when we adopted and have only worked latterly as the boys got older and then also only part time. New adopters need as much time as possible to dedicate to their family without outside distraction and concerns. Sounds like you had a plate full of other worries, which must have been exhausting to deal with at the time. There is so much consideration that needs to be given to the way that adopters are supported during and after the adoption process I also hope that reform is able to encompass this.